In Annual Events – Part 1, I showed some of my favorite annual-based groupings for summer interest. While I’m waiting for spring to decide it’s really here, I’m thinking even further ahead and reviewing some color-rich combinations for fall. The shot above, of the middle path in the front garden, contains several of my must-have annuals and tender perennials, including ‘Profusion Orange’ zinnias and several selections of sweet potato vine (Ipomoea batatas): ‘Sweet Caroline Light Green’, ‘Sweet Caroline Bronze’, and ‘Sweet Caroline Purple’. ‘Raspberry Ice’ bougainvillea (Bougainvillea brasiliensis) didn’t bloom here, but it didn’t need to: the variegated foliage was simply spectacular. Above, it’s in a planter with Cuphea cyanea. No quibbles about blue-flowers-that-are-actually-purple-not-blue with flaxleaf pimpernel (Anagallis monelli); it’s hard to beat when you need a long-blooming, true blue annual. Below is a bit I had tucked into a planter of herbs, including common thyme, rosemary, parsley, curry plant (Helichrysum angustifolium), and good King Henry (Chenopodium bonus-henricus). 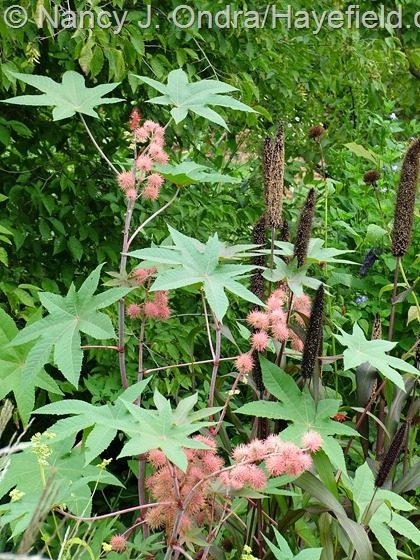 Yeah, pink and brown isn’t one of my favorite color pairings either, but there’s something about this combo of ‘Carmencita Pink’ castor bean (Ricinus communis) and ‘Jester’ millet (Pennisetum glaucum) that works for me. Maybe it’s the tiny touch of creamy pink in the millet flowers? Below is an easier one to like: cheery ‘Starfire Mix’ signet marigolds (Tagetes tenuifolia) with a carpet of pink knotweed (Persicaria capitata). Several years ago I made the front foundation strip mostly edibles. 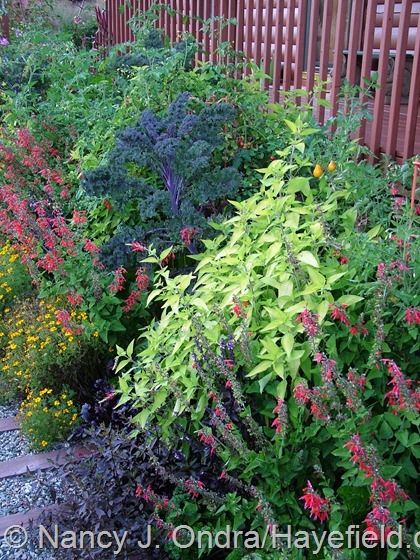 Other than the ‘Wellington Bronze’ toatoa (Haloragis erecta) at the bottom left, which came up on its own, all the rest qualify as veggies, herbs, or edible flowers: ‘Lady in Red’ Texas or hummingbird sage (Salvia coccinea), ‘Golden Gem’ signet marigold (Tagetes tenuifolia), ‘Golden Delicious’ pineapple sage (Salvia elegans), ‘Redbor’ kale, and ‘Yellow Pear’ and ‘Sweet 100’ tomatoes. ‘Outback Sunset’ dense-flowered loosestrife (Lysimachia congestiflora) used to be available all over the place around here, but finding this photo made me realize that I haven’t seen it for sale for quite a few years now. That’s a shame, because it has great-looking foliage and does a super job filling in around the base of taller companions (such as the ‘Angelface Blue’ angelonia below). Hmmm…I see that Proven Winners lists ‘Walkabout Sunset’, which sounds and looks very similar, so maybe the plant is the same but the name has changed. Whew – that’s pretty intense, isn’t it? There’s ‘Frivolous Glow’ dwarf dahlia in front, ‘China Town’ celosia in back, and Fine Wine weigela (Weigela florida ‘Bramwell’) off to the side. 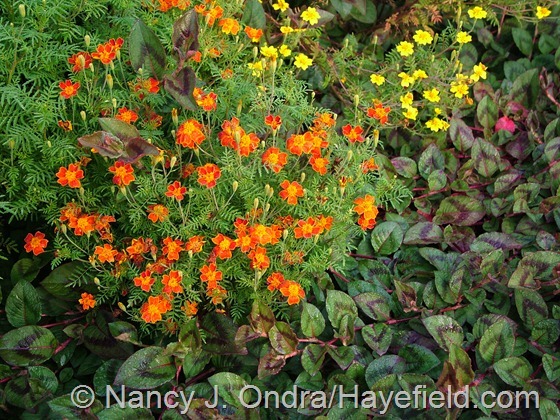 Below, a combination that’s easier on the eye: ‘Blackie’ sweet potato vine (Ipomoea batatas) mingling with ‘Mandarin Orange’ creeping zinnia (Sanvitalia procumbens). 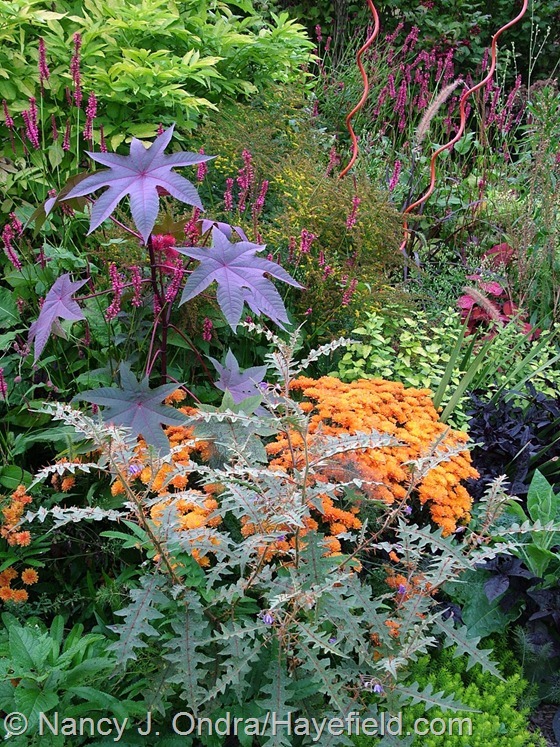 Above, a wider shot of a mixed combination, starring porcupine tomato (Solanum pyracanthum, in front), ‘Carmencita’ castor bean (Ricinus communis), an orange mum, ‘Taurus’ mountain fleeceflower (Persicaria amplexicaulis), and golden elderberry (Sambucus nigra). 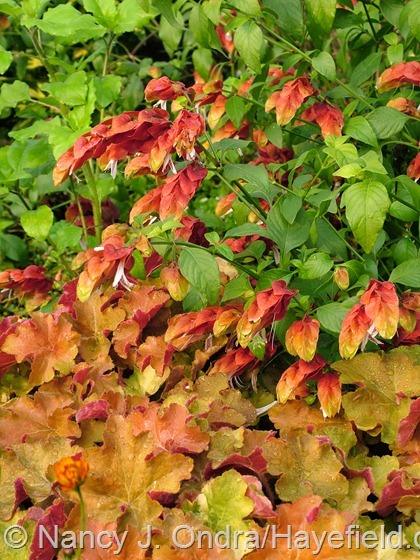 Below is more orangey goodness, with a pairing of shrimp plant (Justicia brandegeana) and ‘Caramel’ heuchera. ‘Black Pearl’ pepper (Capsicum annuum) has a place among my top favorite annuals. It’s easy to grow from seed (even to the point of self-sowing, though the volunteers don’t appear until mid- to late June), and the practically black leaves look great all through the season. The flowers are hardly noticeable, but the glossy fruits are stunning, especially when they ripen from black to bright red. 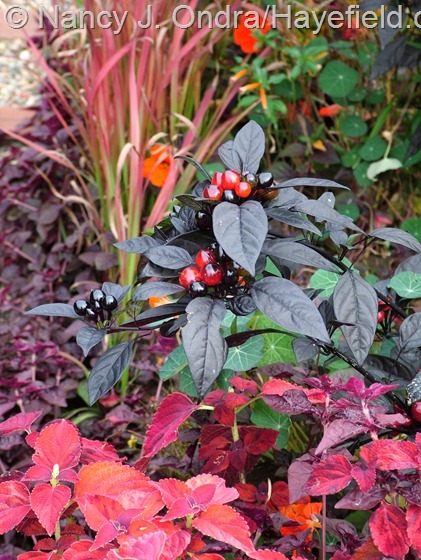 Above, it’s with ‘Sedona’ coleus and Japanese blood grass (Imperata cylindrica ‘Rubra’). 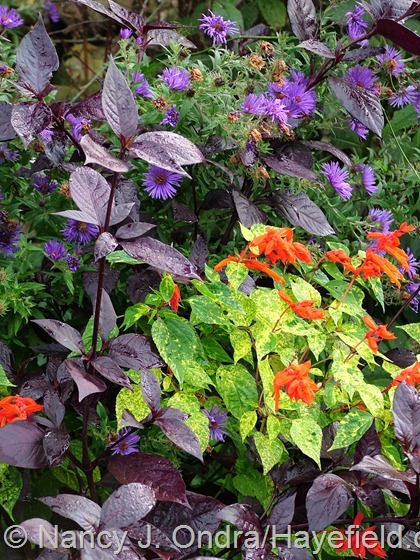 Below is ‘Cramers’ Amazon’, a terrific spiky celosia that can easily reach to 6 feet or more, with purple fountain grass (Pennisetum setaceum ‘Rubrum’), ‘Mahogany Splendor’ hibiscus (Hibiscus acetosella), and some ironweed (Vernonia). 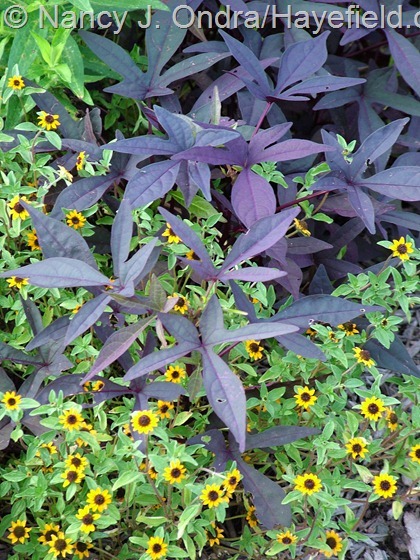 Below, ‘Profusion Yellow’ zinnia paired with ‘Serena Purple’ angelonia (Angelonia angustifolia). Below is another very cool salvia of the same type (sometimes sold as a selection of Salvia vanhouttei and sometimes of Salvia splendens): ‘Dancing Flames’. The yellow-speckled foliage is so showy that you hardly need the flowers, but when they appear, the effect really is spectacular. Below it’s with ‘Purple Knight’ alternanthera (Alternanthera dentata) and a bit of ‘Hella Lacy’ New England aster (Symphyotrichum novae-angliae). Mexican bush sage (Salvia leucantha) is another salvia that’s not hardy here, but I don’t mind buying a new plant each spring to have the tall, violet-purple spikes in October. Above, it’s with ‘Sheffield Pink’ chrysanthemum. ‘Lady in Red’ Texas or hummingbird sage (Salvia coccinea) is easy from seed and even self-sows. Unlike the previous three salvias, which tend to bloom late and sometimes get zapped by early frosts, ‘Lady in Red’ starts flowering by midsummer and keeps going for months. Above it’s with ‘Profusion Orange’ zinnia, ‘Bull’s Blood’ beet, and ‘Angelina’ sedum (Sedum rupestre). That’s it for the flowery combos. In Annual Events – Part 3, I’ll share some of my favorite annual foliage combinations, but first, April’s Bloom Day on the 15th. One of the best things about your posts is that I come away with a list of “must have” plants every time — even some plants I’ve passed by at local nurseries thinking they didn’t “have it”. Now I realize that they’re just missing the right companions! I figured it was a good time to think about annuals for that very reason, Alan: still plenty of shopping time left for this year. Woodchucks (we call them groundhogs here) in the meadow, but not in the gardens, fortunately. There are lots of deer around, as well, but mostly they don’t bother popping over the 4-foot fence to get into the main garden – thank goodness. Now, ask me about rabbits…oh yes, there are bunnies! What a great way to start my day! Love the colour combos! Its hard to pick a favorite, I have too many. Isn’t it a joy to walk around the gardens! Have a great day! Going through these photos makes me realize how bare things are right now. Looking at the seemingly empty beds makes it seem impossible that there will be so much going on 6 months from now. I hope you have a great growing season in your own gardens, Sue! Remember the Carly Simon song “Nobody does it better”? That applies to you and your gardens! 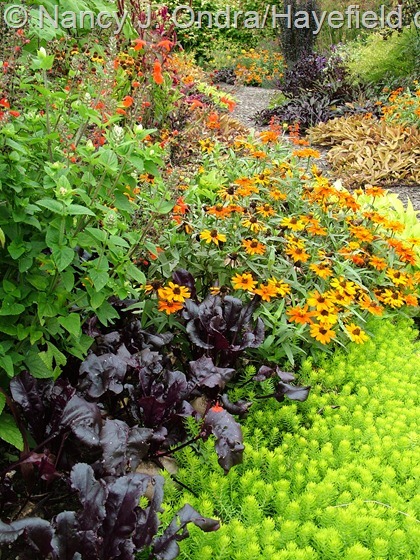 Love the dahlia/celosia combo, and the sweet potato path is amazing. Spring is coming! Do you promise, Brenda? ‘Cause right now, spring seems quite undecided: things have hardly changed for the last two weeks. It looks like Bloom Day with be pretty sparse unless it gets a little warmer soon. Anyway, I’m glad you enjoyed the combos. Have a great week! I know what you mean! My snowdrops have been covered and uncovered by snow 5 times now. Yesterday was warm and sunny, this morning it snowed again . . . The crocus are pretty now! No, really – snow now? I’ll stop whining, then; at least it’s not that bad here. I do begin to see why some people appreciate snowdrops: I don’t think I’ve ever before seen them bloom for more than a week. Lovely combinations. I love the color of dark foliage in several of your vignettes. Wow, Freda, you’re even colder than we are. Last I heard, we are running about 4 degrees below “normal” (whatever that is) and about 12 degrees below where we were last year. On the plus side, the early bulbs sure are lasting a long time. But I think we are both ready for spring to get busy! Thanks, Dee! Yep, once it gets warm here, it gets quite warm. (Except for the rare summers when it doesn’t.) The main issue is how early we get frost: whether we get a few days or a few weeks of bloom on the late salvias before they get zapped. I hope you don’t mind if readers shamelessly copy your pairings. 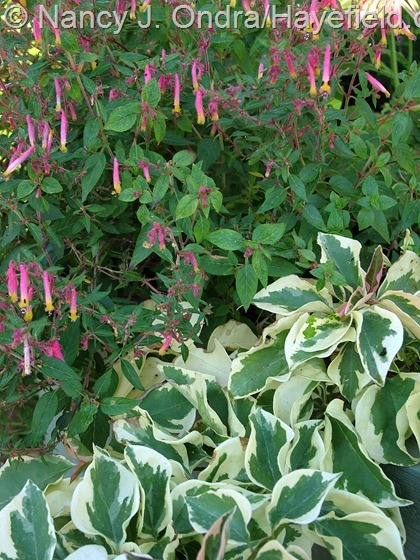 I love the shrimp plant and carmel heuchera combination, which would be easy to duplicate here in Southern California despite the differences in our climates. 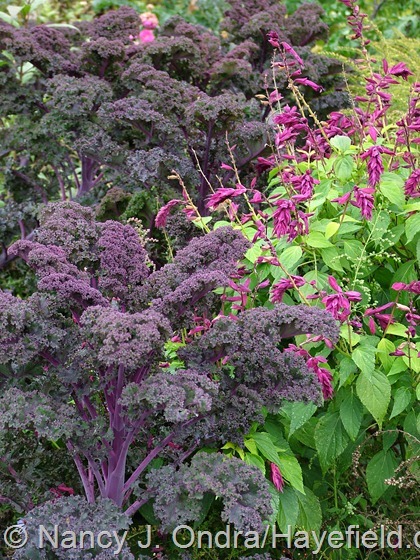 I also hadn’t considered moving the Redbor kale from the vegetable garden to the ornamental garden but that’s a perfect way to bring a spot of purple foliage into those beds. Thanks for sharing your wonderful combinations! Absolutely, Kris – if they work for you, copy away, or substitute whatever similar plants are better suited to your garden. That orange pairing is one of my particular favorites. Finding your blog is one of the best things about this winter. I am so inspired by your plantings. 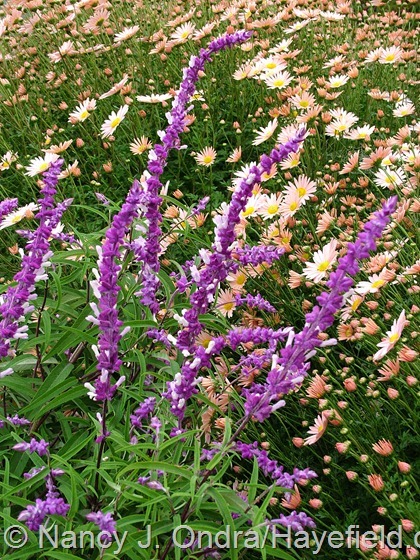 Especially liked Salvia leucantha with Sheffield Pink chrysanthemum in this post. The seeds you sent me have sprouted! Thank you! That’s excellent news, Amy. Have fun creating your own combinations with them this year! Nan, what a feast for the eyes! 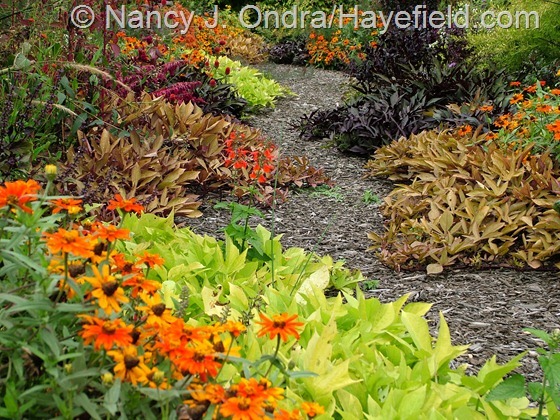 I love all the sweet potato vines sprawling out onto the pathway… Just a technical question: What percentage of your beds is devoted to annuals vs perennials? I find that most of my beds quickly fill up with perennials and that there is little room left for more than just the occasional annual plug-in. I’m always afraid of cramming things in too closely but after looking at so many pics of your garden I’m thinking the “no bare earth” policy might be better than leaving room for things to expand. For instance I just planted some starter shrubs of spirea ‘Goldmound’ on 3 foot centers. The plants are tiny and look silly in the middle of all that mulched ground. I would love to surround them with some well-mannered annuals that would not smother them while they are trying to get a foothold. Any suggestions? I have the same problem, Kate. When I divide perennials in early spring, I tend to stick them in the “empty” spaces, then run out of room for annuals. So now, I end up clearing out some spaces every year to make sure there’s room for the temporary stuff: mostly along the edges, but also a few deeper areas. Overall, I try to keep the front garden about half annuals and half perennials. Around the spireas, maybe Profusion zinnias (they stay in tidy mounds that are 12 to 18 inches across), or ‘Purple Lady’ iresine (it makes a really nice carpet, spreading about 2 feet in all directions), or ‘Purple Knight’ alternanthera (2 to 3 feet across; more vigorous than the other two, but you can prune it if it starts to swamp the others)? Or, maybe a few of the Sweet Caroline or Sweet Georgia sweet potato vines? With any of these, keep an eye on them and trim them back as needed to keep them from smothering the spireas. And do you plant the zinnia profusions 12 inches apart? Yes, about that; I like my plants to mingle. They could spread more than 1 foot if they really like the site, so you could try them to about 16 inches apart if you want to use fewer plants and don’t mind waiting a bit longer for them to fill in, or if you don’t mind a little space between the mounds. I need that ‘Hella Lacy’ aster, if only for the name. Good thing it’s pretty too! It’s a great purple and can get to about 4 feet, or you can keep it at 30-36 inches if you prune it a few times in the summer. It was named by garden writer Allen Lacy for his wife. It’s hard to find these days, but I see Arrowhead Alpines has it on their site: ‘Hella Lacy’ at Arrowhead Alpines. Another treat for the eyes Nan. As Autumn gets a real grip here and everything starts looking tired and dry, it is inspiring to see such freshness. It gives me renewed drive to review parts of next year’s summer garden. I adore that pink celosia ‘Cramers’ Amazon’, and the way you utilise such an array of Zinnias. Neither of which are available here in NZ sadly. We only get the boring bedding Zinnias, and those mad looking sticky-up type celosias. Love what you do Nan. Please keep posting, I look forward to part 3! Thanks, Kerry – great to hear from you. I hope you had a wonderful growing season and got lots of projects done! Nice pairings! I have to agree with Ann, finding your blog has been a nice thing about this winter. Especially as it is still winter her in central WI with high plowed drifts and generally 6″ of snow still covering the majority of my yard and garden. Highs during the day at about the freezing mark and lows at night still dipping into the teens! That’s so kind, Rachelle – thank you! We’re actually getting snow flurries here today, but at least there is no snow on the ground. I hope you’re blessed with warmer weather very soon! ‘Profusion Orange’ zinnia is a favorite of mine as well. 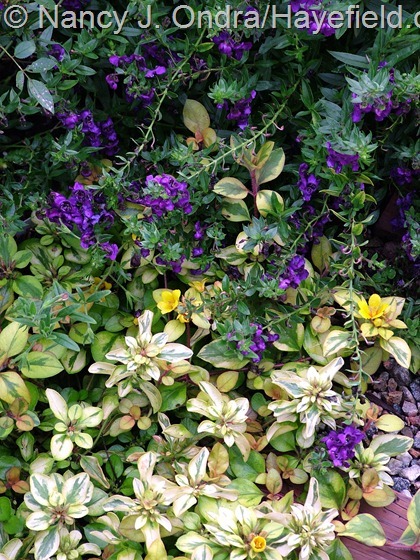 It gets by with very little water and blooms like crazy until frost – almost an orange groundcover. I will have to try those ‘Starfire Mix’ marigolds, generally I like single and semi-double flowers best. 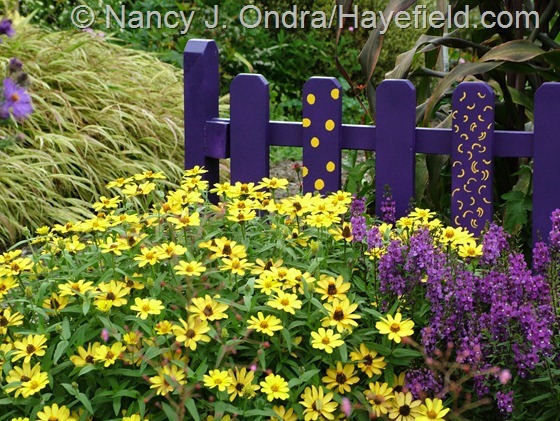 I love the color and the contrast in your garden, it is really amazing. The photos are very well done, and very enjoyable. Thanks so much for reading, Charlie. Happy spring to you! One of the things I love about gardening is how many times I have to eat my words, and your photos of color combinations have been responsible for quite a few meals. I once “hated” variegated foliage, coleus, tuberous begonias, tropical plants, and the colors orange and pink (to name just a few) and now my garden is full of these things. Now I need to have that shrimp plant. 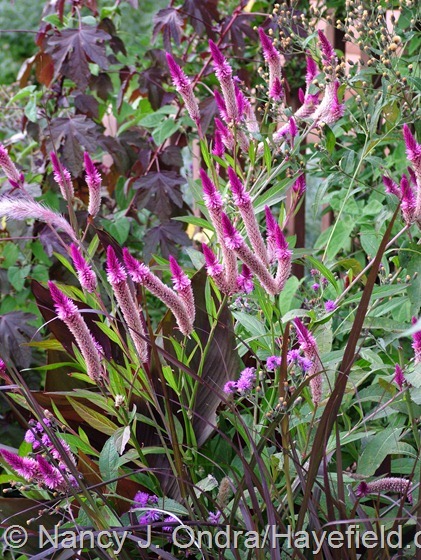 Also, thanks for the heads up about Celosia ‘Cramers’ Amazon’ — in a similar way, I’ve just been emailing with Carol Smallwood about her wonderful coleus called ‘Smallwood’s Driveway’ to double-check the placement of that apostrophe. She really did find it in the driveway, too. Funny you say that, Nancy, because I’ve had the same experience: I tell myself that I hate certain colors together, or that I’ll never grow [fill in the blank], and before I know it, the plants have put themselves together and look fantastic. I LOVE ‘Smallwood’s Driveway’ coleus!!! It’s really hard to find around here, but I did have it for a season or two, and I think I have at least one shot of it in the upcoming annual foliage combinations post. Had to let you know the seeds you sent have been successful. The variegated pokeweed is already lighting up the garden and the red whisker clammy weed is starting to bloom. That’s super news, Carole – thanks! Yours are currently still chilling…as is pretty much everything else up here in PA.
Love your posts! I wanted to share some of these images on pinterest and wanted to make sure that it was ok, as long as I shared a link back to your blog. I read your post on pinning images and i’m just double checking :) Keep up the great blogging! Hello Kelly! Sure, as long as you’re pinning the images directly from my posts here, go for it. Thanks for asking! Just a quick note of thanks – for the inspiration and education. I’ve learned so much from your blog – posts like these – and also the ‘It’s Personal’ series. My garden is a sea of mulch dotted with shrubs and trees, so this is the year for filling it all in. Slightly intimidating but you are a great mentor! Thanks so much, Jen. I wish you lots of fun with your filling-in projects this year. Have a great growing season! I have a very small garden but am trying very hard to make it a four season sustainable garden. This is a challenge in the Midwest but I am having a great time trying to do it! I will take what I can fit in from your beautiful landscape. I wish you all the best with your beloved garden, Eileen. I do have a whole lot of space, but I remember the special pleasure of having a small garden, where I could give every inch a lot of attention. I have to agree with Alan, I added a few must have to my list as well. Love the sweet potato vines edging that walkway. Do you add anything for slug control? The only time I’ve tried the sweet potato vines in my ground beds they were demolished by slugs. I’m eager to try it again after seeing this picture! 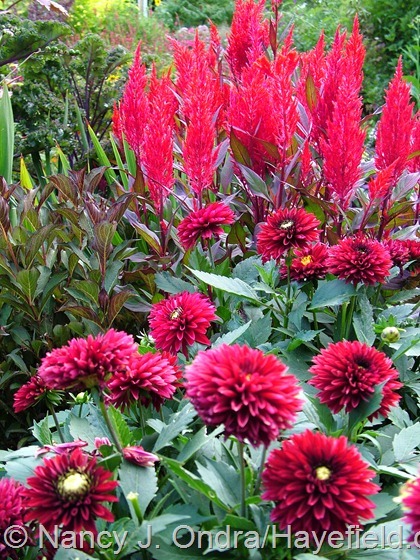 Love the red dahlia with the celosia and weigela. Curious if you start the celosia from seed or buy the plants? Beautiful, as always! Thank you, Jamie! For whatever reason, I don’t have a big problem with slugs here. (Now that I’ve stated that, they’ll probably be terrible this year.) Yes, I start the ‘China Town’ celosia from seed; I haven’t ever seen plants of it for sale where I usually shop. Good luck with your sweet potato vines, if you decide to take the chance! 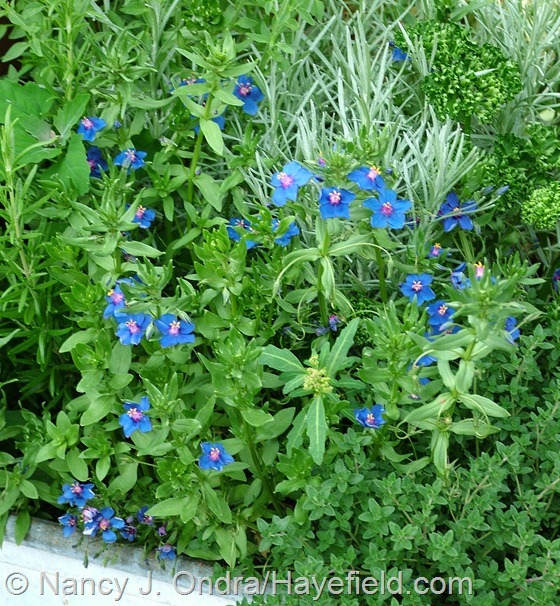 Do you grow your annuals from seed or buy them ? I love your annual combos but it could sure get expensive very quickly ! I grow almost all of them from seed, or let them self-sow. And for those I have to buy, I usually get just one plant and multiply it by taking cuttings. Keep in mind too that these aren’t all from one year: this gallery covers about 5 years worth of combinations.